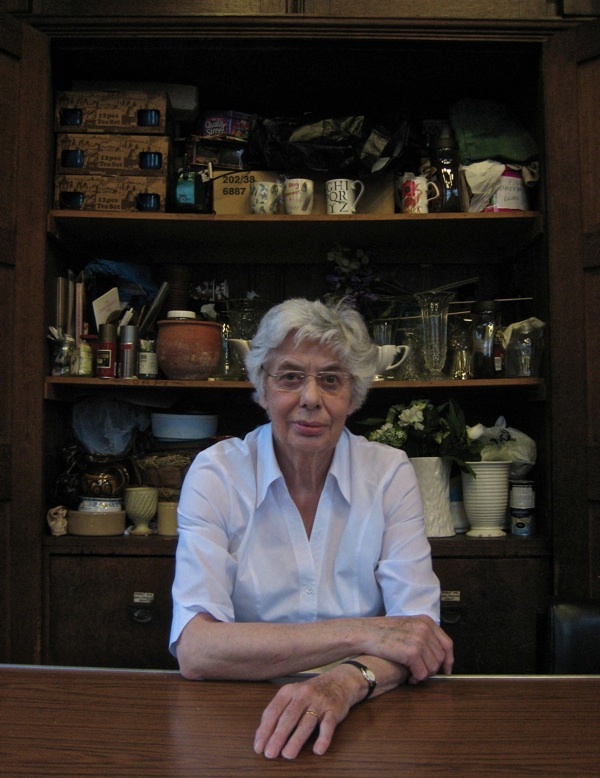 This is Vera Hullyer sitting in front of the cupboard in the parish room where she keeps the vases and other paraphernalia she uses for creating the spectacular floral displays at St Dunstan’s – just one of myriad ways she has been involved with this ancient East End church since she first came here in 1945. Vera’s life has been interwoven with that of St Dunstan’s and its community over all these years, and she has become its devoted custodian, captivated by its mythic history and speaking of the distant past as vividly as she describes events of recent years. 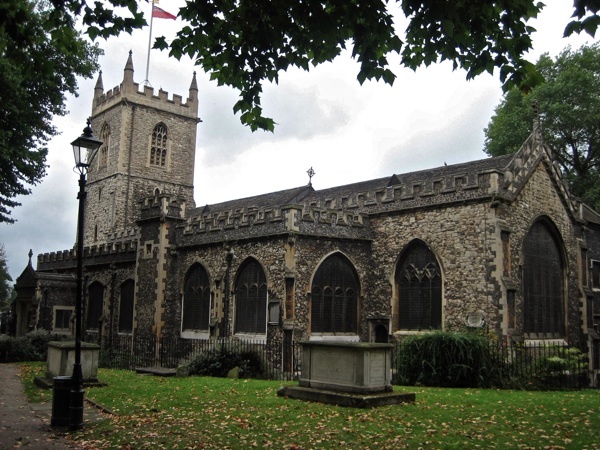 Older in origin even than the Tower of London, St Dunstan’s once served the entire area now defined by the Borough of Tower Hamlets, which means that until Christ Church was built in the eighteenth century it was the parish church for Spitalfields. 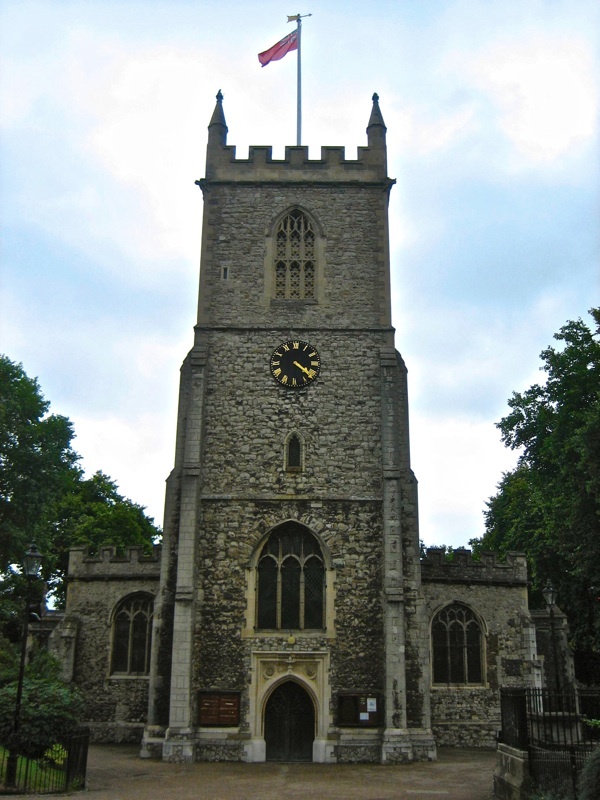 A wooden church dedicated to All Saints was built in Stepney after St Augustine’s conversion of the English in the sixth century and St Dunstan himself built the first stone church here in 952. A rough hewn stone relief from his time survives today, set into the wall behind the altar. Along Fieldgate St from Whitechapel, I followed the route of the former path across the fields to visit this low-set medieval ragstone church that for centuries stood among orchards and farms until the modern East End grew up around it, spawning no less that sixty-seven “daughter” parishes out of the former rural parish of St Dunstan’s. Stepping in from the August rain and placing my umbrella in the stand, I was greeted by that distinctive silence which is unique to old stone buildings, and standing there in the gloom to survey the scene beneath the vast wooden roof, like a great upturned ship, I realised could have been in a country church almost anywhere in England. A door opened at the far end of the chancel, spilling illumination into the half-light, and Vera came out of the shadows with nimble steps to greet me, shepherding me kindly to the octagonal parish room, where she made me a cup of tea and I was able to dry out my raincoat while she told her story. I had an aunt that lived nearby in Stepney, she stayed here all through the war and had her roof blown off seven times. And my mother promised me that when the war ended we could come up from Fordingbridge, where we lived, to visit her for a holiday. So we came in August 1945 for VJ night, and I remember the church bells and the hooters on the river. Next day, we went up to Buckingham Palace and joined the crowd up against the railings. I came to stay with my aunt every year after that for holidays, until 1953 when I came to London to work at the Air Ministry and I lived with her for the first two years. I was young and impecunious and seventeen and three quarters – people didn’t really go away from home then as they do now. I’m half a Londoner, on my father’s side – he was born in Lambeth – and that bit came through. I’m a very different person now than if I had stayed down in Fordingbridge. Because I had been up to London for holidays, I knew my way around and I enjoyed it. I worked for several officers who had been in the war and Spitfire pilots who had been promoted – for a young girl it was very exciting. I was responsible for ordering and making sure that all the radio parts were in stock. From the Air Ministry, I went to be PA to a senior officer in Whitehall and I was there all through the Suez crisis and when Cyprus was partitioned. I moved into a hostel in Queensgate, Kensington, in Spring 1955. It was a nice area, but there were four of us to a room. You got bed, breakfast and an evening meal, and the food was terrible. This was before fridges, and I acquired an ability to drink black Nescafe and toast made on the gas fire. At twenty-two, I moved out to Chiswick because we could afford a shared flat. But I still kept on coming to St Dunstans, and when I got married I came to live here and never moved again. From when I first came to London, I joined the church badminton club to get to meet people. I met my husband, Charlie Hullyer, through the club, we were members of a big group of people there and I knew him for quite a while before we got married. He worked at the Whitechapel Bell Foundry as a carpenter. He made the frames for the bells and his last job, before he died in 1981, was to make a frame for the bells at Canterbury Cathedral. We got married at St Dunstan’s in 1965 and my son was baptised here. Charlie had a flat because he was the last child to leave home and he took it over after his parents died. So when we got married, we had somewhere to live – we didn’t have to move out like most people did. It was very difficult for the children of families to find homes locally and stay here, that’s why many East End families are split. When I first came to the Ocean Estate, it was a bomb site and we used to walk my aunt’s dog there and there was this smell I will never forget. Then the flats went up. Most people were living in two-up two-downs, with no bathroom and a toilet in the backyard. Some were still living in bomb damaged homes. People were worn out, they had been evacuated and come back, and many had lost family in the bombing. So they were delighted with the new flats, it was real step up and it was luxurious. The population then was old East Enders and Jewish people, but it’s changed a lot since 1953 and now it’s changing again. The Jewish people have all gone, and West Indians and Bangladeshis came in. It was all social housing then and people were poor. But the new housing is a mixture of some to buy and some to rent, so we have young professionals today who work in the City or at Canary Wharf. Whereas before it was just secretaries and machinists in the garment trade, while the men all worked in the docks. 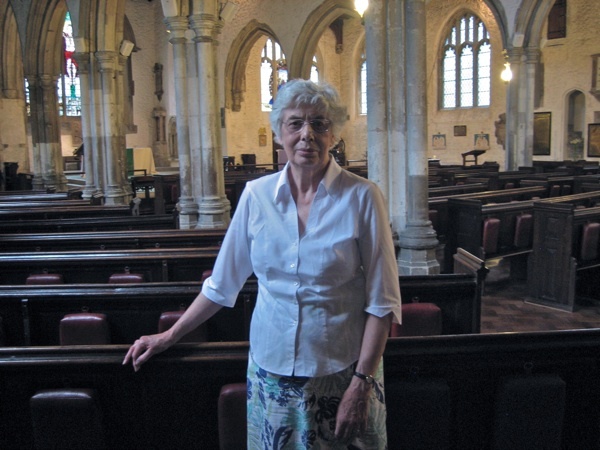 Over more than sixty years now, Vera has pursued a constant involvement with St Dunstan’s, as member of the parish church council, as a church warden, as a sidesperson and as member of the congregation too. She has read the lesson. She has raised money to replace the magnificent wooden roof and to renovate the elaborate churchyard railings. She has headed the 17th Stepney Cub Scouts and she has done the church flowers for the last twenty years. When her husband Charlie brought his carpentry skills to the construction of crosses for elaborate performances of the Stations of the Cross performed upon the streets of Stepney in the seventies, Vera was stitching costumes. It all adds up to a rich existence for Vera Hullyer at the centre of her chosen community in this remarkable building – a charismatic meeting place with a long history of devotion, offering an endless source of tales of those who have gone before to inspire the imagination. 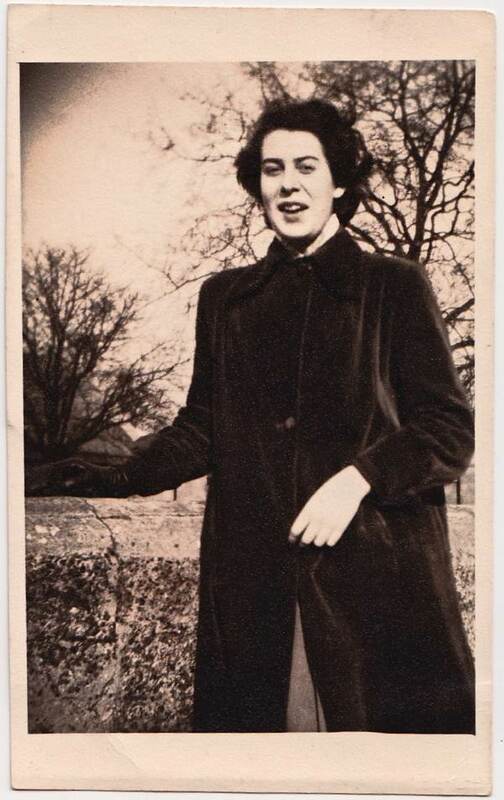 Vera at the Tower of London when she first moved to London to work at the Air Ministry in the Winter of 1953, aged seventeen and three quarters, in the bottle green coat that she bought with her first earnings. 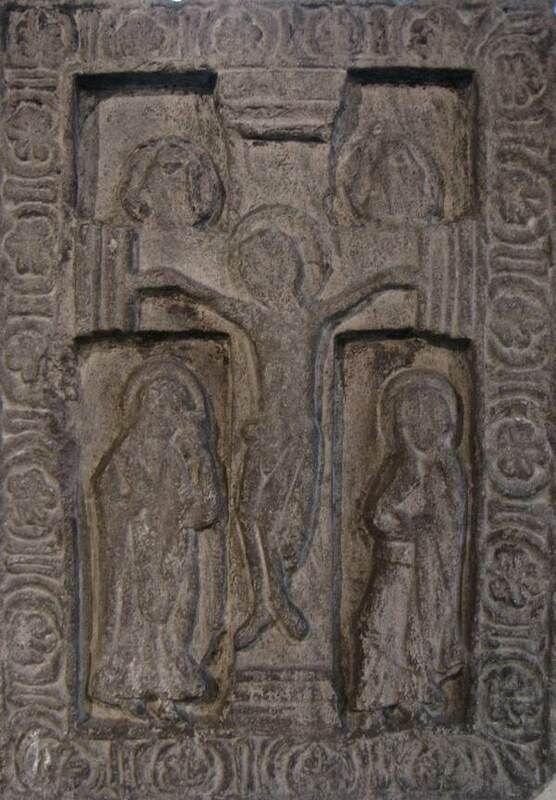 This tenth century stone relief carving is a relic of the church built by St Dunstan in 952. 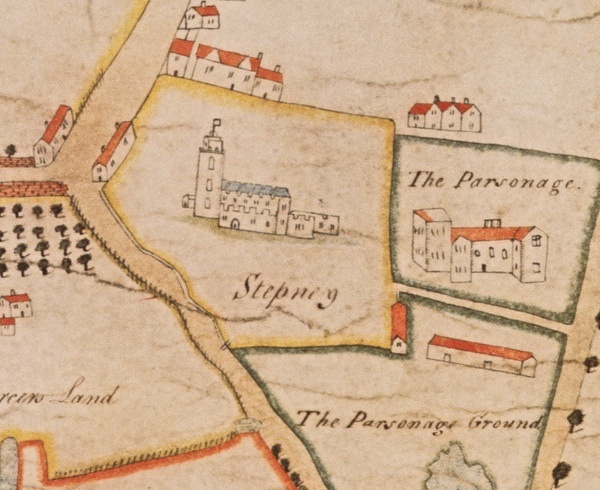 St Dunstans on a map of 1615. 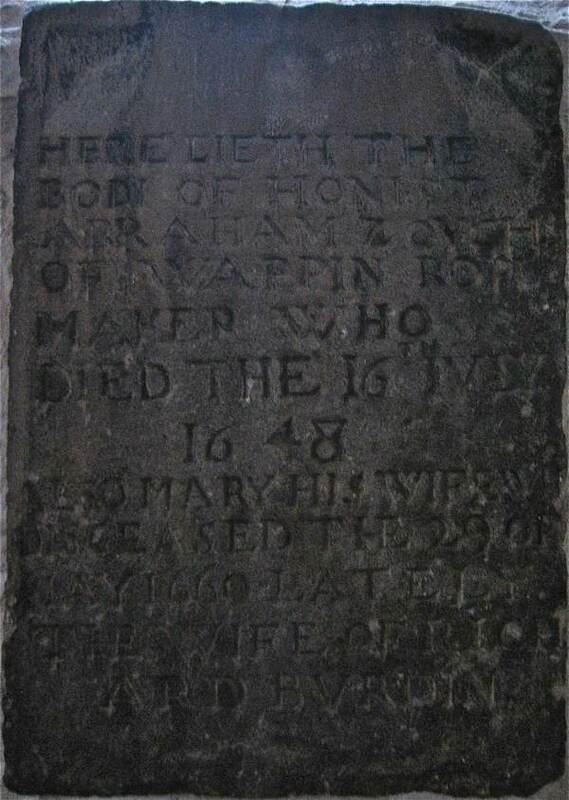 Honest Abraham Zouch, Ropemaker of Wapping, died 16th July 1648. The Carthage stone, a souvenir of a sailor’s visit to Tunis. 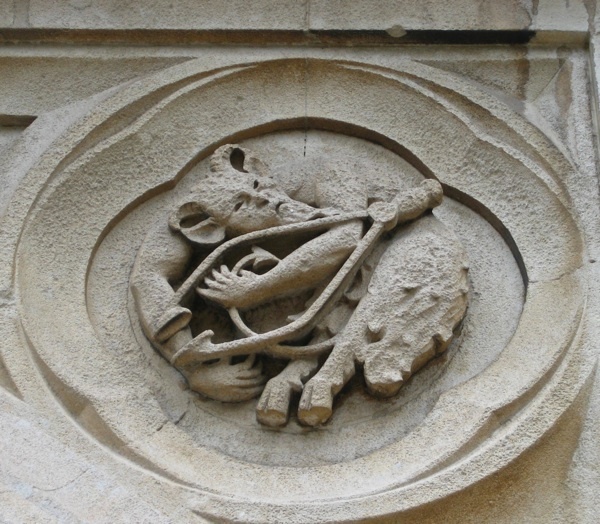 Spandrel over the West door – legend has it that the devil came to tempt St Dunstan when he was working at his anvil, and the saint tweaked the devil’s nose with his red-hot pincers. Vera Hullyer first came to St Dunstan’s on VJ day in the Summer of 1945. 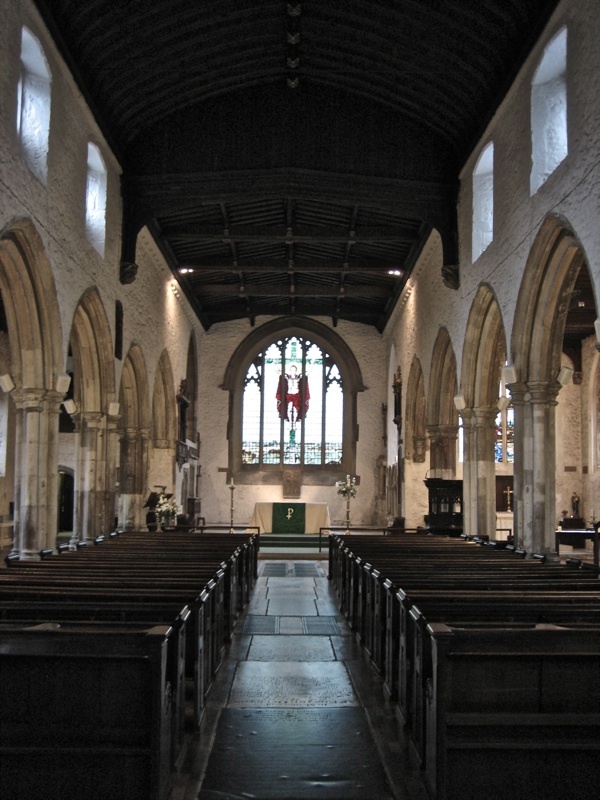 Great story, I look forward to visiting St. Dunstan church when I’m next in London. From our 13th floor flat in Latham House we had a perfect view of St Dunstans. We have cine film somewhere that my dad took from the balcony when we moved in in 1963 (when I was 6 months old) and the same view some 16 years later when we were rehoused. The change in the skyline was dramatic. As an Irish Catholic family we weren’t St Dunstan’s parishioners but we did occasionally go there for ecumenical (agape) services. But my big memory – and one that Vera clearly played a big part in – was of the Passion plays which I seem to remember took place when Norrie McCurrie (probably spelt wrong) was vicar. I thought of them recently when watching the Michael Sheen led version in Port Talbot. Really took me back to what I remember as a great cause of excitement in my childhood. Thank you Vera for your part in making that happen. I visited St Dunstans recently and was fortunate to meet Vera whilst I was there and she very generously showed me around the church and told me some of it’s fascinating history. I particularly loved the wonderful stained glass window of blitz torn Stepney by Hugh Easton amongst the many treasures to be found there. I will be a regular visitor to this beautiful place. GA, I see that you did not take a professional photographer with you on this occasion; you have taken a superb portrait of Vera in front of the parish cupboard. GA, you are a superb photographer period. What a pity I hadn’t discoveredd this website and didn’t get to talk to Vera more when we met at St Dunstan ‘s last Sepember. One of many constant gems bringing joy. Brings back fond memories of my time at St Dunstan’s when Father Young was there. I spent a lot of time there when I was at school across the road from the church, funnily enough with Vera’s son Paul. Nice lad. The street lay out from the map of 1615 is identical to this day and I recall once, a boy coming to school with a skull which had come out of the plague pit in the churchyard. I also remember the passion plays and the cross with a man strapped to it being carried through the streets at night. Stepney Green is well worth a closer look. My Wife & I we’re Married their in 1988 , I have a beautiful copy of an old etching of the Church at home which I cherish , My Life will be inextricably linked for evermore to this Beautiful Church for which I am very grateful.